Drs. 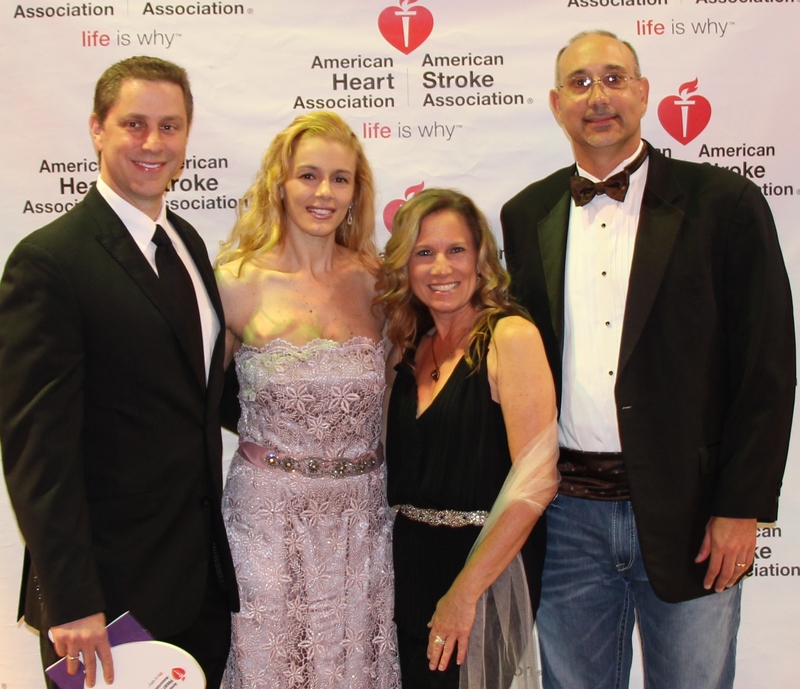 George and Nikoletta Carayannopoulos and Dr. Matthew and Michelle Hay at Heart Gala. GALVESTON – “I have Aphasia. Never give up. Never give up.” The words echoed throughout the ballroom at Moody Gardens Hotel & Convention Center Sept. 17 as 300 of Galveston Island’s finest celebrated the fight against heart disease and stroke with the American Heart Association and the University of Texas Medical Branch at Galveston. Not a sound could be heard as Aaron May, a 36-year-old survivor, shared his story for the first time since suffering a stroke on June 18, 2014. May, who currently lives with Aphasia, a language disorder that affects the ability to communicate, has been working hard over the past two years to regain his speech and walk easily without a cane or wheelchair. Currently, over $500,000 is being funded in active grants at UTMB Health to find new cures and treatments for heart disease and stroke patients. The gala, chaired by Annette Macias-Hoag, associate vice president for UTMB Health, and associate chief nursing officer for UTMB Angleton, and co-chaired by Christine Wade, director of Patient Care Services and assistant chief nursing officer for the Emergency Room at UTMB, raised over $170,000 for lifesaving research. The annual fundraising event also honored the past 20 years of its honorees, including Bob and Mary White, Jim and Suzanne Little, and Drs. Michael and Colleen Silva, among many more. Sean O’Donohoe with Allstate Insurance served as auctioneer for the gala, helping the organization sell seven exciting items, including a trip to San Miguel De Allende, Mexico and the Island of Antigua. Jonathan Martinez, an anchor with KPRC 2 News and a Galveston native, served as emcee. Bringing his mother as a date, Martinez talked highly of growing up on Galveston Island and what the American Heart Association means to him. Sponsors in attendance were UTMB Health, John P. McGovern Foundation, Dr. Abe DeAnda, Annette Macias-Hoag and Daniel Hoag, BARD, Biotronik, Boston Scientific Corporation, Drs. George and Nikoletta Carayannopoulos, Dr. Leon Bromberg Charitable Trust Fund, Medtronic, Inc., AMOCO Federal Credit Union, CenterPoint Energy, Karen Flowers and Ted Shook & VJ Tramonte, Seal and Ross Grief, Dr. Robert and Jill Kaale, Navigant, Philips Healthcare, Dr. Selwyn Rogers, Jr., Drs. Colleen and Michael Silva, St. Jude Medical, Dr. Barbara Thompson, Christine and David Wade, Kempner Capital Management, Inc., Biosense Webster, Advantage Medical Resources, Steven and Shiloe Burzinski, Galveston College and Dr. Thomas D. Kimbrough.